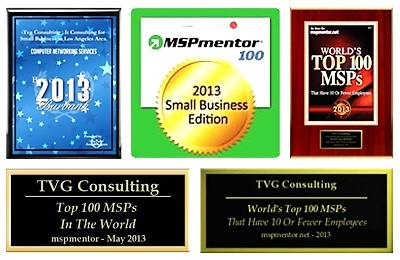 Founded in 2005, TVG Consulting is a privately owned IT services and support company headquartered in Burbank, CA. Our IT professionals hold multiple certifications for many of today’s most popular technologies, with over 30 years of small business and enterprise IT experience. Our core services include managed IT services, IT consulting, VoIP solutions and cloud services and solutions. We believe in fixed costs. We believe your time and technology needs are important. We believe in responding faster than full time staff (if you have them). We believe you need to sleep at night knowing your IT operations will work at 100% the next day. We believe you need accountability from your vendors and complete honesty in approach. Why choose TVG Consulting for IT services? Did you know that each time your network goes down, it can cost a 20 person network over $2000-$15000 per incident? Most business focus on how much initial costs are, they do not know all the hidden soft costs of an ineffective network can cost them. By following industry standards, resolving chronic issues, proactive maintenance, you can eliminate costly downtime and give you your time back. The best results we can produce for you is giving you the peace of mind that you can go home and come back the next day that your employees are working the way they should be. Your network is optimized for business usage. At least it’s supposed to be. In todays networks, facebook, youtube, personal business can take up to 2-3 hours out of employee’s work day. See how we can show you how to get that productivity back. Every business will go through at least 4 disaster of their data/servers in their lifetime. Backups are good to restore files. What if you had a disaster to your network? What if all your company email could not be recovered? How about all your contracts or data? See how we are using the most cost effective, redundant, databackup and disaster recovery solution in the industry for computer support in Los Angeles services. What industries does TVG specialize in? What geographic areas does TVG service? For on-site IT services, we services the Greater Los Angeles Area including Beverly Hills, Burbank, Covina, Commerce City, Eagle Rock, Encino, Glandale, Hollywood, North Hollywood, Pasadena, South Pasadena, San Fernando, Sherman Oaks, Santa Monica, Orange County, Santa Ana, Silver Lake, Studio CIty, West Los Angeles, Vernon, Alhambra, Monterey Park, Culver City, Arcadia, Van Nuys, Northridge & Monrovia. For remote support and services, we can service any location in the world. Where are TVG's employees located? 100% of our team is located within the Greater Los Angeles and Orange County areas. While we are technically an “outsourced” IT services provider, we only hire top notch talent within our own geographic region to ensure our clients experience the best service and communication possible. What are TVG's service and support hours? We hold office hours Monday through Friday, from 8:30 AM to 5:30 PM. We also offer our clients 24×7 support for critical issues and emergencies. What services does TVG provide to manufacturing clients? What type of management solutions does TVG supply for manufacturing clients? ERP agnostic Support – work with various ERP solutions. Is a Managed IT Services approach a good solution for a manufacturing firm? Is your data increasing every 6 months and your IT infrastructure is not able to handle it? Are your older legacy systems not being supported by your vendors and panic ensues whenever there is any issue? Are your locations growing? Users? Mobile sales force? Do you have many single point of failures that could cause a disaster if not addressed sooner than later? Is your current IT staff overwhelmed, overextended, under skilled, overpaid? Is routine system maintenance a hassle? Too many moving parts? Do you have a single throttle point for accountability or you’re not sure? If you agree that your data is one of the most important aspects of your manufacturing firm and the control, security and management is just as important, then you need to work with an IT advisor partner like TVG. We not only drive and handle your IT goals and objectives, but we are vendor agnostic and our only goal is to maintain your stability so you have the capacity and budget to grow.